» Pretty fancy trees, eh? For a change of pace on a rainy weekend, how about a quiz? The question: Can you identify what kind of trees these are? If you can, please tell me by leaving a comment below. I shot this frame the other day on Francisco Street in Newport Beach, CA. The street trees looked impressive to me. Considering their size and complicated structure, and the apparent size of the root systems as far as they are visible above ground, I was surprised to see no sign that the sidewalks were buckling. Eucalyptus? Hard to tell without seeing the leaves. I do not have any idea but do not think it is a Moreton Bay Fig Tree. You-Tube link for that tree is https://www.youtube.com/watch?v=Lvb3mJZet6A. Root/base structure do not look similar. Also too different type of bark I think. I put ¨Francisco Street in Newport Beach, CA¨ in Google Earth search bar. Then jumped to a street view. I came up with the coordinates of 33°38´38N 117°53´5.04¨W elev 47 m. But when I put that in my Google earth or browser search bar that alone did not do anything for me. 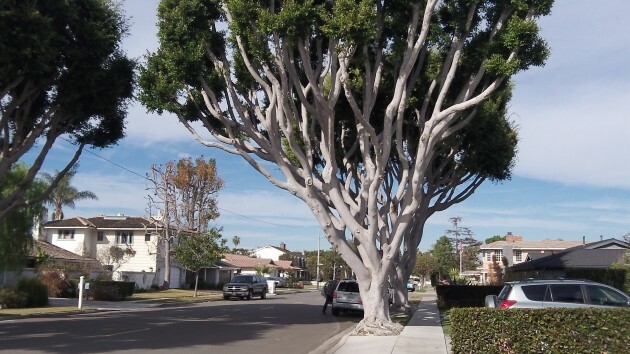 You do get a great look at the trees and can zoom in for a close-up look from Google Earth. Does American Coral tree (Erythrina americana) sound right? Without a close-up of the leaves, or, better yet, a fruit or flowering structure, there is no way to identify these trees. However, they do look superficially like a Ficus (the fig genus). There are 900 fig species in the world, so, you can imagine that a lot more detailed look is needed to identify the trees. Having said that, you might ask a botanist at the nearest botanical garden or university. Surely they’ve examined these very trees.